Suppose you’ve scored a colorful Roseville vase, an antique painting and yards of burlap during recent trips to the fleas. The big challenge now? Unifying all your treasures to create a cohesive look—and for flea market decor enthusiasts, that’s where tips from design consultant Kelley Motschenbacher come in handy. “Many people have textiles or a couch they like, an antique they inherited or artwork they love,” Kelley says. “They just don’t know how to pull it all together.” She suggests evaluating what furniture you already have that you’ll never part with, making a realistic budget and getting inspired by textures and colors to create a new take on the old. Kelley’s love affair with fabrics led her to start her own home-based e-design service, Kelley & Company, for home and garden design counseling. A year ago, Kelley sold her home in Corona del Mar, California, to a client, fully furnished—taking only some of her favorite pieces with her (and parting with a few she still misses). Filled with comfy pillows, eBay steals and weathered signs, this home by the sea is far from a conventional beach house. “I’m drawn to the crusty stuff,” she admits. The house is “modern country,” Kelley says, “and that’s how I’d describe my style. Texture, wicker and wood—which all mix well in a country setting” for unique flea market decor. Kelly’s tips for making unique pillows to complement your home’s flea market decor. • Be Bold: Don’t be afraid to mix things up. Kelley has made pillows from everything, from rags and old rugs to a Navaho weaving. If you found an unfamiliar material you love, use it. • Size Wise: Varying the sizes of accent pillows creates a pleasing change of scale for visual interest. No need to have all pillows in one uniform size. • Mix Not Match: Try mixing pillows made of coarse grain sacks, which have a neutral base, with bright florals that have hints of the same accent color. The end result looks unified without being matchy-matchy–perfect for flea market decor. • Change it Up: Mix square pillows with lumbar pillows or other shapes, varying from 18 to 22 inches. • Love It or Lose It: Whether it’s $20 worth of burlap you found at the flea market or textiles you found surfing online, find patterns and prints that speak to your style. Kelley even made a pillow for the bedroom with leftover fabric from a reupholstered chair she loves. • Color Scheme: You can mix bold prints and solid colors on pillows by using the same trim on them, which ties the look together. • Easy Does It: Not a masterful sewer? Don’t fret. 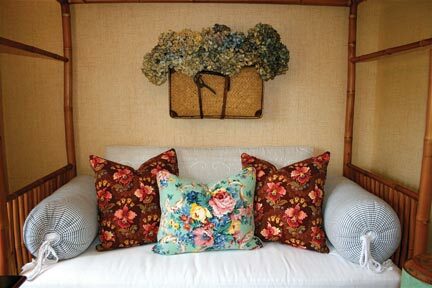 Learn how to make a slipcover, which is a lot easier than making a pillow since it doesn’t involve a zipper. Place the slipcover on a repainted vintage French bistro chair for an easy DIY project. 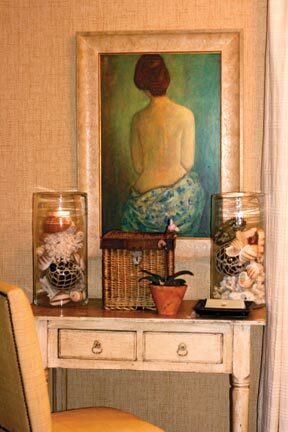 This entry was posted in Decor Inspiration and tagged collecting, Flea Market DÃ©cor, vintage finds by Flea Market Decor. Bookmark the permalink.